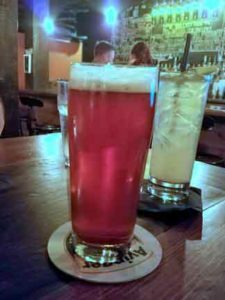 The Kingdom Taproom is a surprising find in Saint Johnsbury, Vermont. As its name suggests, Kingdom Taproom is a bar. But the food they serve is beyond any bar food I’ve had in the area! 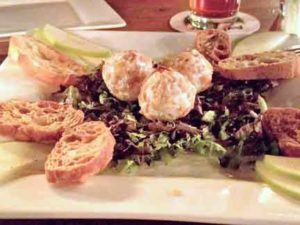 Right on Railroad Street, this Saint Johnsbury restaurant and bar has a perfect downtown location. In the basement of a historic block building, the atmosphere is the first thing that grabs your attention. It is dark, which can be a bit disconcerting after leaving the daylight of the street. But it is very cozy. Cushioned bench seating mixed with industrial metal chairs, dark woods and metals bring that modern look to an old space, and the bar takes center stage. The Taproom is first and foremost a beer place. Part of the back of the bar is taken but by a large chalkboard showing the 15 beers current on tap (though more are available). 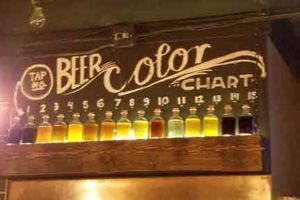 A handy chart shows the color of the beer on each tap, letting customers see what they are getting, and helping match palate to selection. When you get your menu, you are also brought the beer list showing you what’s on tap, and the two beers that will be following it. A specialty cocktail list, and a great wine selection finishes off the bar. The next thing that I noticed was the service. People are more laid back in the Kingdom, and that often means servers don’t want to bother you. And to be honest, many restaurants have a hard time keeping the appropriate number of staff as Vermont traffic is up and down throughout the various seasons. That was not the case here. I watched as servers stayed on top of their tables, were ready with drinks, kept tables clean, and kept a good eye on their customers. Our server was with us no more than two minutes after being seated, and the place was about half full. We sat at the end of a communal table; another couple was at the other end but that wasn’t disturbing to our conversation at all. In fact I almost didn’t notice they were there. Seating includes plenty of 2 and 4 tops available, bar seating, and a few communal tables. There is also a great sitting area if you’re just grabbing a few drinks or have to wait for a table to open up. Our drinks and our food came faster than I had expected given the number of people in the dining room. We ordered a Charcuterie Board, and the special Chevre balls rolled in almonds, for our apps. The Charcuterie board blew me away. 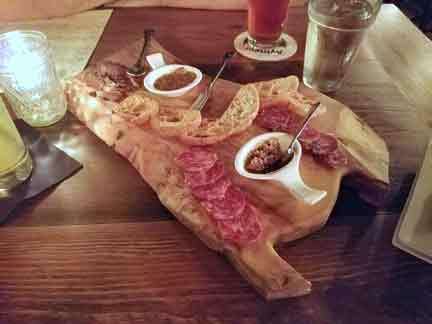 I am a huge fan of meat and cheese boards, so I was excited on seeing this option on the menu. The board contained Maple-wood smoked Salami, Duck Breast Pastrami, and a Smoked Paprika Chorizo, served with crostini. There were also two different accouterments –one a mustard the other maple based. We decided our favorite combination was the duck with the mustard. For our meal we ordered two separate sandwiches. My husband got the brisket sandwich with coleslaw that was on special. I had been to the Taproom before and had fallen in love with their pulled pork, so I went with that and a side of potato wedges. The sandwiches were beautiful, and so full that meat was falling from the bun. Often when ordering a brisket sandwich you get some fatty meat with veggies on top. That was not the case here. The brisket was obviously slow cooked. A thick slice filled the bun, and was so well cooked it flaked apart as you ate it. I thought it was cooked perfectly, though my husband thought it was missing a spicy kick. The pulled pork was delicious. The maple barbecue sauce was thick and sticky, flavorful, and well incorporated into a pile of slow cooked shredded pork. I was amazed at the lack of fat in the pork, a problem I have found in similar dishes. I will say that there should have been more bbq sauce. The first time I had tried the pulled pork here, that wasn’t a problem so it may have been an off night. The buns are large. They look and taste house made. After sitting full of meat for a while as we sampled other things and had a few drinks, they did get a bit soggy – another problem I have found with sandwiches of this type. I am not a coleslaw eater – but was impressed with this slaw. 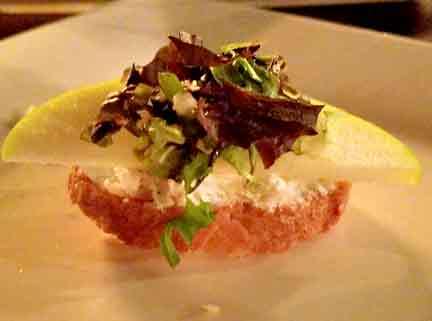 It was fresh, crunchy, had a bit of a citrus zing to it, and best of all, it was not floating in mayo. The potato wedges had a slight crisp to them and were well cooked and salted. 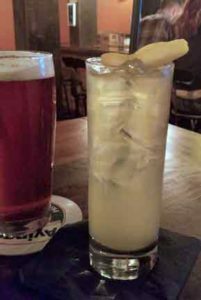 The Taproom has an extensive bar, and a wonderful cocktail menu. I ordered the Spring Fever. Made will Barr Hill Gin (Hardwick made, honey based gin), a syrup, and a little Kombucha, it was refreshing, the perfect drink to match the beautiful spring day outside – something I can see myself enjoying on the hottest days of summer, and it wasn’t overly filling as sometimes happens with mixed drinks. My husband had a Switchback and a martini. He’s pretty picky about his martinis and said this one was well made. In the future I hope to go back with a group so we can sample most of the beer menu. 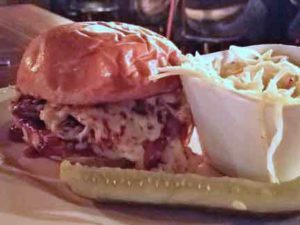 Prices are only slightly higher than what you pay at other local restaurants, but for the quality for the food and what you get the price is well worth it. Menu items are under $15, and consist of some inventive apps, cheese plates, Charcuterie boards, soups, salads, and gourmet sandwiches. Nothing fancy – but everything goes well with a beer! If you are in the Saint Johnsbury area, you have to check out the Taproom. There are a number of fun shops nearby so it makes a great afternoon outing, or a place to bring visiting family and friends to – try a number of Vermont products, cheeses, beers and liquors and check out local shops, a perfect day in Vermont.